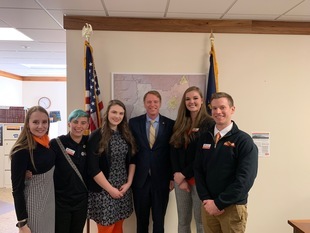 I was excited to receive another visit from student government representatives from OSU Cascades. These students have stepped up on behalf of their campus to advocate for funding for a new Student Success Center as well as funding for higher education to address rising tuition prices. This group continues to impress me with their knowledge of policy, ambition and willingness to advocate for their fellow students. I will work to help deliver the funding they seek to ensure OSU Cascades students have the resources they need to succeed. I am excited to join the Governor and several legislators from both sides of the aisle in participating in the Governor's annual Food Drive. Donations should be made here for individual contributions. We also invite local businesses to make donations of local products to a Central Oregon basket to be raffled off in support of the drive. If your local business is interested in contributing a product to our Central Oregon Basket, please contact my office at 503-986-1727. 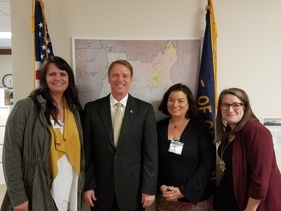 It was my pleasure to meet with local members of the Oregon Nurses Association on Tuesday. As a member of the Senate Committee on Health Care, I know how important of a role nurses play in our health care system and I strongly support them. We discussed several issues that will be important to the ONA this session as well as issues impacting nurses in Senate District 27. I look forward to working with and advocating for them this session. Thanks for stopping by! I'm proud to be serving our students and families as the Co-Chair of the Joint Committee on Student Success, Subcommittee on Accountability and Transparency (That's a mouthful!). My work here will be focused on ensuring the best environment for our students and their families within our school system. SB 573 is an example of such work. 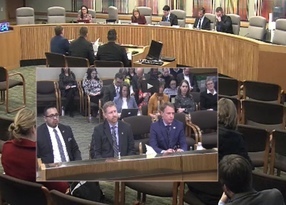 This legislation puts processes in place to protect our students from problematic behavior by expanding the scope of redress and protection that students have against inappropriate behavior from bad actors. You can watch my testimony by clicking the above image. 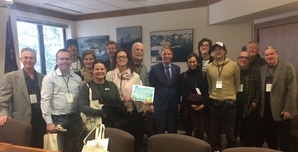 Despite the snow and conditions, 14 constituents from Renew Oregon made it to the Capitol for their lobby day! We had a respectful conversation about renewable energy and Oregon's role in reducing greenhouse gas emissions. Thank you for making the trip and expressing our concerns.